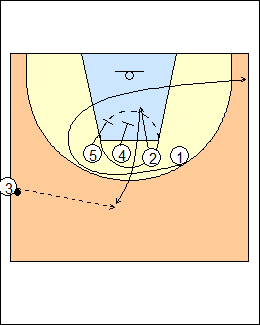 3 inbounds, 1 curls around the line then goes to the weakside corner, after 1's cut, 2 takes his man down and uses a double screen by 4 and 5. 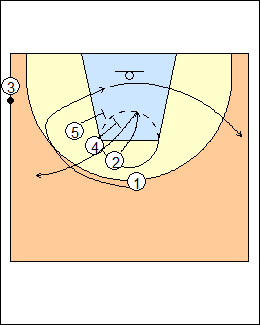 5 cuts to the basket if X5 shows to help on 2's cut. See Inbounds - Sideline Fratello 3, Frankston stack. Line can be run from the corner, change the angle. 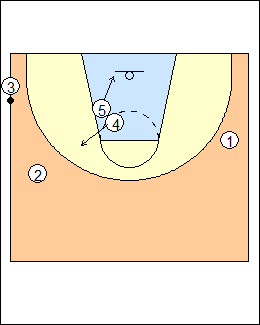 See Inbounds - Sideline Fraschilla (corner). After the double screen, 5 rolls to the basket and 4 pops out.